In the Booth are seeking self-motivated people that are passionate about creating exceptional special event experiences. As a member of the In the Booth franchise network, you will be supported by a dedicated Head Office team with an unstoppable work ethic and a deep-seated passion for the wedding and event industry. After nine years in an industry that bears the same age, In the Booth provides the systems and experience that is vital for small business success. In 2007, Steve and Kate Austin became enamoured with photo booths. As a professional photographer, Kate had heard chatter about passport style booths at weddings and events and straight away, her interest was piqued! Whilst the concept was a lot of fun for guests, she knew these commercial booths didn’t provide the image quality that clients deserve for their weddings. Steve and Kate spent two years designing and perfecting their ideal booth. Kate’s photographic and creative background together with Steve’s event production and technical skillset laid the foundation for the first In the Booth photo booth. From humble beginnings sketched on a piece of paper, In the Booth snapped its very first photo of our young family in April 2009. 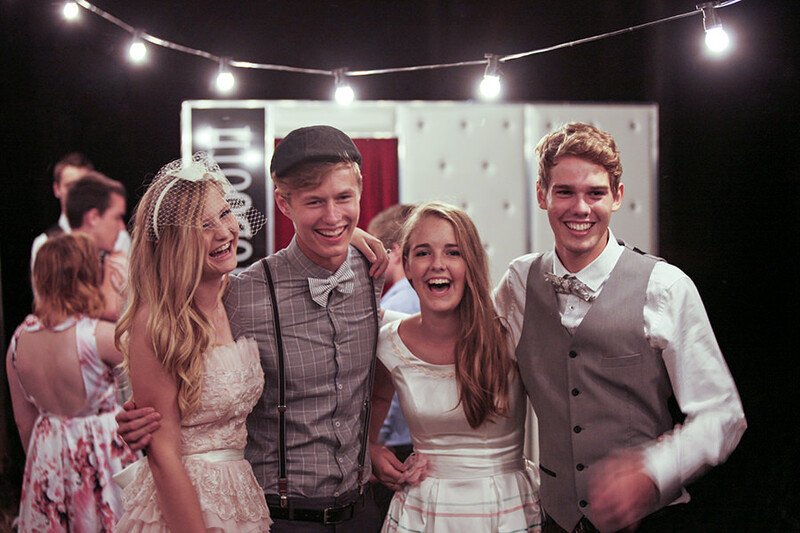 Our launch night in our garage consisted of friends and family snapping sample photos ready for our first bridal show. Some of our friends even showed up in their wedding outfits so we could capture bride and groom samples. We stood back and watched our friends and family get swept up in the magic that happens within the walls of a photo booth. The iconic design and style of an In the Booth photo booth and the magic created by guests behind that velvet curtain remains unchanged to this day. 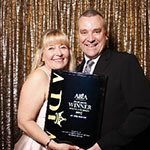 We are an Australian designed, developed and family owned company. Our children are growing up alongside In the Booth; learning what it means to work hard and to apply excellence to everything they do. On any given day, you will find our family working hard alongside us be it at a bridal expo, our yearly conferences or just helping out on the busy days. Collectively, In the Booth employs just under one hundred Australians as a network. While our photo booths themselves are important, they’re really just a beautiful meeting place for everything that is In the Booth. When researching photo booths, you will find that manufacturers love to claim the title of the fastest set up or the widest range of booth models. During our decade in the industry, we have found our customers are not interested in either of those features. In the Booth customers are interested in a high-quality photo booth experience where magic will happen for their guests behind that curtain. 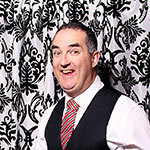 In the Booth’s mission is to be the most loved photo booth company. We believe a photo booth by itself is nothing more than an empty box. It is our people and their unrivalled dedication to customer service excellence that has allowed us to continue to exist since our very first booth snapped it’s very first photo ten years ago. 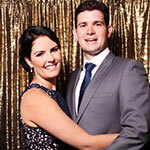 Australia is littered with photo booths that fell victim to a trend, and the trend was owning a photo booth business. 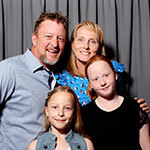 The photo booth industry was in its infancy in Australia from 2007 until 2011. From 2012 until 2014, photo booth businesses sky rocketed from only a handful to hundreds. Photo booth manufacturing companies began to meet this fledgling market and sold countless identical units to eager new business owners ready to capitalise on a newborn industry. Fast forward to 2019 and many of those businesses have ceased to exist or have changed hands many times over. Business owners have attempted to hang out their shingle next to their neighbour who owns a photo booth that is identical to theirs. These two small business owners resort to competing on price with no distinguishable brand or unique product offering. In the Booth offers protected operating territories not available through stand-alone manufacturers or licensing arrangements. Franchisees have the assurance that an identical competitor will not be opening their doors down the street and that our focus remains on finding and thrilling new customers, not selling more photo booth machines. Whilst we pay close attention to market shifts and customer desires, we are not reactionary to trends. We are not the brand that looks over the fence at our competitors; rather we look internally to our own customers. Every success and every failure at In the Booth has been developed, celebrated or started over solely in-house. Starting a business in 2019 is easy – staying in business, not so much. As the Australian photo booth industry enters its double-digit years, our longevity is not only thanks to our photo booths. It’s thanks to our people and our customers. The word ‘franchise’ has the bad habit of conjuring up thoughts of a soulless chain store with cheap imported products and lack-lustre staff. Come and work a day with us and let us show you first-hand how that couldn’t be further from our daily truth. A great franchise is a group of people who are working together toward one common goal – being loved by their customers. Without successful franchisees, there would be no In the Booth. Without a successful franchisor, there would be no In the Booth. An In the Booth franchisee is a hardworking Australian who loves the In the Booth brand and has an obsession with customer service excellence. In the Booth franchisees are from all over Australia and all stages of life, but all have support within our hardworking community. An In the Booth franchise offers flexibility and exceptionally low running costs and fixed overheads. For franchisees that are passionate, motivated and invested in daily operations, their business can offer excellent return on investment. A franchise agreement can be compared to a business version of a marriage, except it is for a set term which is usually between five and seven years. During that period, In the Booth has an agreement with the franchisee, and the franchisee with In the Booth. The agreement is to operate under the In the Booth brand with excellence, integrity and quality communication. This agreement is designed to give franchisees everything they need to achieve small business success under the banner of a trusted and recognised brand with almost a decade of experience in the industry. The agreement is also to protect the In the Booth brand, fellow franchisees and most importantly, our customers who are relying on us for their most important celebrations. If this sounds like a whole lot of responsibility, a franchised brand may not be for you. If you have a personal commitment to excellent and consistent service; if you love people and building strong business relationships, we invite you to contact us to find out more about bringing In the Booth to celebrations in your home town. "I’ve been an In The Booth franchisee for four years and increasingly my work / life balance gets better. The lifestyle that I now lead allows me the freedom to work hard but enjoy more family time that traditionally busy working parents would envy. Every event I attend makes me realise the business I am in is making people happy, and of course that makes me enjoy my work even more. With amazing support from the franchise team, and managing my own staff, my business lets me take the control I need to grow as a professional. Now owning two franchise territories, and looking to add more booths and bookings to both areas, I see a great future in an industry that is growing with me. As part of the national franchisee team, we are always working together to help each other improve the product and service we provide to our clients each week. The camaraderie and close working relationships we have, keeps me motivated to show off our booth to as many people as I can. I continue to look forward to what In the Booth will bring me, my family and my business in the future. I’m positive it will be bright!" "Great opportunities don't come around every day. After working as an attendant for three years with In the Booth we had a chance to become business owners. This was something we had always considered, but we never felt we had found the perfect project for us - until In the Booth! Where else can you help create fantastic memories, solidify friendships, build relationships and mold just the right mood for any occasion? Over two years on, and with the support and guidance of the head office team, we have grown the business into a lifestyle where we can enjoy time with the important people in our lives. Best decision we ever made. " "In the Booth - where memories are made, fun is had and everlasting images are snapped! During the 14 months we have owned In the Booth Sunshine Coast, we have loved every minute of it. From brain storming with our fellow franchisees to the team atmosphere, the In the Booth environment is like no other and the support you receive from the head office team is wonderful. We love listening to our customers and guests' giggles as it’s a sure sign they are enjoying every moment in the booth. The high quality products and service we are able to offer our customers is world class. We were blown away with how technologically advanced In the Booth is, you won’t find another photobooth company that even compares. The 'wow' factor the booth creates in a room is incredible from the smart looking attendants to the polished, quilted booths. We’ve made so many lifelong friendships through the industry. It has been one amazing ride and we can’t wait for many more years of boothing to come!" "In the Booth is one franchise that truly lives and breathes putting the customer first. It was for this reason I chose to be part of this network! Having the administration all taken care of by head office means I can lead a busy life with a young family yet still grow my business too!" Do I need previous business experience? Previous business experience is not essential however a positive outlook, exceptional work ethic and dedication to your client’s complete satisfaction certainly are! In the Booth is built on a reputation of exceptional service in all we do. We attend special events for a living and there are no second chances in the event industry! What are the main benefits to the In the Booth franchise model? The In the Booth model has been developed to ensure franchisees have the time to work ON their business, not just IN their business. Whilst there are many hands-on elements to the business, we have developed world first systems specific to the photo booth industry to allow franchisees to focus on the most important aspects of owning a business – providing exceptional service and finding new customers to share this with. Franchisees are able to hit the ground running with a proven business model that thrills customers from day one and avoids many common operational challenges experienced by small business owners. How much does an in the Booth franchise cost? This depends on the size and location of the territory, and whether you are interested in purchasing an existing In the Booth franchise or a greenfield (new) territory. As a guide, a new In the Booth franchise territory can range from $35,000 to $50,000 depending on territory particulars and number of photo booths. How much working capital will I need? This will also vary depending on the size of the franchise you are considering. As with any business, you will need access to working capital particularly in the early stages whilst business momentum is being generated. Particulars around working capital will be discussed further in the application process. What kind of returns can I expect from my In the Booth franchise? In the Booth franchisees range from small operators who run their franchise as a secondary income stream, to full time boothers who enjoy In the Booth as their primary employment. Returns will depend on factors such as the size and population base of your territory, number of booths you operate, and how much passion you are prepared to put into your business. The most successful In the Booth franchisees are highly self-motivated people who understand that getting out there and getting their hands dirty is the only path to success in small business! If you are purchasing a going concern, historical sales information will be provided following the completion of your Confidentiality Agreement. We have a comprehensive training program in place for all new franchise partners. This includes training at In the Booth Head Office in Brisbane and also on site in your local franchise territory. It covers extensive event and back of house operations. Approximately one week will be required for structured training time with ongoing training provided via phone, video and email as you learn the ropes of your new business. Is this a full or part time business opportunity? This depends entirely on your personal and business goals and family situation. In the Booth has franchisees that are single operators, husband and wife teams, those who run their business in conjunction with other employment or in conjunction with other businesses. All these factors and more contribute to how your In the Booth business will be managed and will be discussed extensively with you throughout the interview process. Do I need to work in my In the Booth business? You bet! The most profitable businesses are often those that are owner-operated. It is exceptionally important that new franchise owners dedicate the first 12 months to being hands-on in their business operations to learn and understand every aspect of their business. You will need to be actively involved in the day to day running and not view your business as a passive investment. Any successful business will always require an invested and hands-on leader. The In the Booth model provides extensive support across all aspects of your business, from client liaison to event support, post production, marketing and financial requirements. This greatly reduces the onerous tasks that weigh down small business owners, allowing the freedom to focus on existing and new customer experiences. In the Booth supplies all aspects of marketing, operations, ongoing training, sales tools, access to industry-first intellectual property and technical support to ensure each and every event is a success. What are some elements of In the Booth’s franchisee selection criteria? We are looking for highly self-motivated, business focussed people with a love for celebrations of all kinds. Successful business owners have the self-confidence to begin and nurture professional relationships and love meeting new people. We look for a positive, ‘get it done’ attitude and an optimistic approach when facing challenges. An appreciation for procedures and a great team attitude are vital. You will have an old-fashioned approach to customer service and excellent written and verbal communication skills. Whilst this can be influenced by several factors, the period from first enquiry to initial training is typically around eight to ten weeks. What is the difference between an existing location or a new location? An In the Booth territory that is being sold as a going concern means the sale particulars will be negotiated between yourself and the existing owner. The franchisee selection process and criteria still applies in these cases. A trading In the Booth business will more than likely have future confirmed bookings and goodwill which will be negotiated as part of the sale price. A greenfield territory will have minimum brand presence in that area. I own a wedding or event industry business. Can I own an In the Booth franchise as well? Yes you can. In the Booth works especially well in conjunction with other event based or photography businesses, and several of our existing owners run other businesses within the same industry. However, we do not allow brand merges and In the Booth franchises must be presented and advertised as their own entity to retain brand clarity for all In the Booth partners. I own a photo booth business. Is there a way I can trade under the In the Booth brand? Yes and no. We do not permit other photo booth companies to operate with their photo booths under the In the Booth brand and do not offer licensing arrangements. Licensing does not require the same level of commitment from either party and does not provide the same assurances to our valued clients as a franchise agreement. We invite enquiries from photo booth operators who understand the innate differences with the In the Booth model and are interested in converting their current business operation to an In the Booth franchise. How long is an In the Booth franchise agreement term? Typically five years with an option to extend after this time. Does a franchise territory restrict where I can operate my business? Our franchise territories are not designed to restrict, but to protect. A franchise territory is In the Booth’s guarantee to you that another In the Booth business will not be permitted to compete with you within your own territory. A franchise territory provides you with the confidence to invest your time and energy into building YOUR business, knowing that another identical operation will not start up in the next suburb and compete against you. As a mobile franchise, this is even more important as your defined franchise territory minimises operational travel expenses and maximises your local business impact. Can I own more than one franchise territory? Yes, but not straight away. After a proven history of successful business operations within your home territory, we will be open to discussing options for expansion with you. Can I source my own products? Yes and No. Some items required within your business operation can be sourced locally. Products relating to our customers and guest experience are provided through our network. One of the reasons In the Booth has existed for close on a decade is because of the level of trust we have with our customers. In the Booth is known for exceptional products and quality across all aspects of our brand, and to maintain this consistency and trust all customer-related equipment and consumables are supplied by In the Booth. So you want to be a Boother? 1. Complete the enquiry form below to express your interest. We will be in touch to have an initial discussion and talk about further steps to complete your application. A video conference interview will be arranged to explore the opportunity further. All parties that would be part of running the business should be involved in the video interview. 3. Let us get to know you better. Completion of our detailed franchise questionnaire assists both parties to be certain this is the right opportunity for you, and identify any particulars that need further exploration. Should the initial interview and questionnaire be successful, we will issue you with a Confidentiality Agreement. You will then be provided with further information regarding the particulars of the franchise opportunity you are interested in, including sales figures. 5. It’s time to meet in person. We arrange to meet you for an in-person interview. We will discuss your potential franchise territory in further detail and answer any questions you may have. It’s time for you to experience the booth in its natural environment – on location at an event! 7. Legal documents and homework. If all parties are happy to proceed with the franchise, we provide you with your Disclosure Document and Franchise Agreement. You will need several weeks to review all the legal documents of the franchise agreement and seek independent advice. Your training is arranged and will be provided in both your franchise location and at Head Office in Brisbane. You will need to set aside at least two weeks of uninterrupted time for training and to become well-acquainted with your new business operations. You’re ready to provide exceptional In the Booth event experiences to your customers and their guests in your hometown! If you are excited by this opportunity and would like to find out more, please submit our franchise form below and we will be in touch. Enquiries are held in the strictest confidence, and will not be passed on or discussed with any other parties. Terms of Enquiry: In the Booth welcomes enquiries from all interested parties who seek information with a genuine desire to explore becoming part of the In the Booth network. We take the success of our existing and future partners seriously, and non-disclosure and confidentiality agreements will be required from all parties before the release of any detailed information. By submitting this form you declare that information is being sought for the sole purpose described above, and further declare that information is not being sought for any other purpose either for self or on behalf of another person or operator or interested party currently operating in or potentially entering into the photo booth industry. Obtaining commercial information under false pretence or via deceptive means is a breach of Australian Consumer Law, (previously known as the Trade Practices Act) and details of any parties found to be engaging in such conduct shall be forwarded to our solicitors for action under s18 of the Competition and Consumer Act 2010 Cth. These Terms of Enquiry must be agreed to below before this form can be submitted.